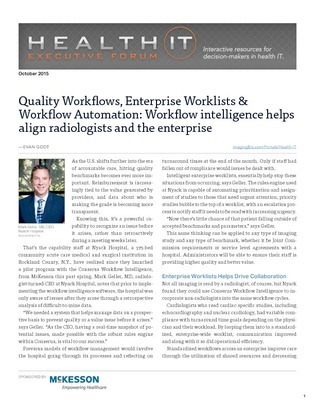 The healthcare industry is constantly looking for ways to improve workflows, bolster quality and productivity, and mitigate risk. Organizations are trying to implement better streamlined processes, but the time it takes to implement new tactics is painful. How can healtchare organizations start tapping data and improving workflows - in a realistic timeframe? This whitepaper discusses the advantages of taking a proactive approach to leveraging data can reveal fast, effective pathways to improving quality. Read on to find out how to stop being reactive with your workflow improvements, and how focusing on quality can help mitigate risk.